Over the weekend I was cleaning out my gadget closet and found two of my old netbooks. I was planning to repurpose them for some programming efforts, but a new Kickstarter project has changed my mind. For a $225 pledge, you can turn a netbook into a telepresence robot, which is right up my alley. 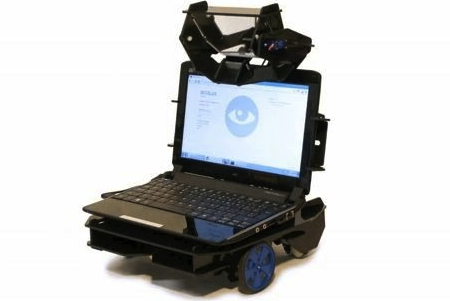 The Oculus Surveillance and Telepresence Netbook Robot project is looking to secure $15,000 in pledges by Jan. 31. You can commit as little as $30 for an Oculus T-Shirt, $225 for a full robot kit (netbook not included) or $420 for a deluxe robot made of wood, complete with a headlight, T-shirt — for you, not the robot — and RoboRealm software. Even with the largest pledge, you’ll have to provide a netbook. Although I’m a robot enthusiast, this project makes perfect sense. Netbooks are cheap enough and have more than enough horsepower and sensors to power a robot. I suspect that while many netbook owners still use their device as a traditional laptop, others have moved on to tablets or other mobile devices. That means an old netbook collecting dust can gain a second life. Using the netbook’s webcam, an Arduino board and open source software, the Oculus could work well as an inexpensive “place shifting” solution. The robot’s owner can remotely move the robot and see what the it sees, while communicating with other people over the web through a netbook’s integrated microphone and speakers. The Oculus even has a charging dock that it can back into on its own. Note that this isn’t the first netbook-powered robot potentially hitting the market. Willow Garage has long offered the TurtleBot that combines a netbook with a Roomba iCrate base and an Xbox Kinect(s msft). As a result, you’ll pay much more for that solution; $1399 for a full kit including the netbook.